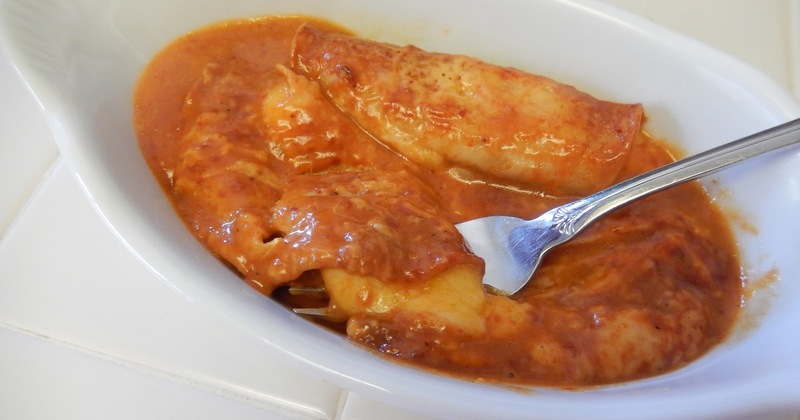 I know it's supposed to be Taco Tuesday but this good news I'm sharing is somewhat appropriate since it's about another type of Mexican food: Enchiladas, specifically the Real Good Frozen Enchiladas I love. You know... the protein-packed, low carb ones where the "tortilla" is actually made of chicken and cheese and filled with all sorts of yummy enchilada fillings like shredded chicken, beef, pork or cheese. Check out my review of them back in December. 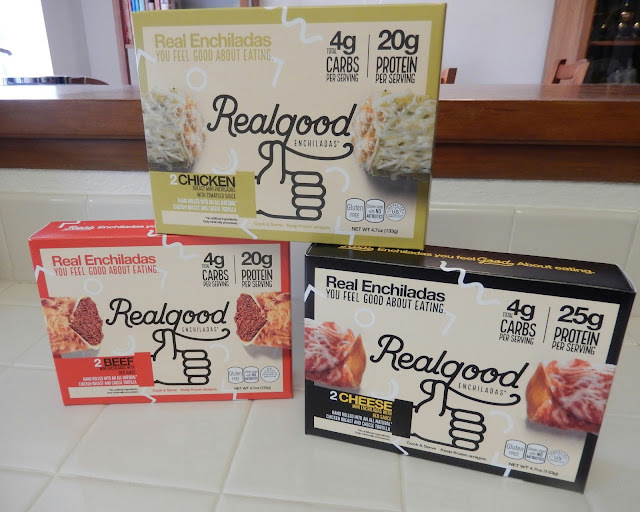 You can still buy the enchiladas online (feel free to use my affiliate coupon code: eggface to score 10% off your Real Good Foods online orders) but the good news I was asked by the company to share is that the enchiladas are now available in more local supermarkets including: Ralph's, Kroger, Fred Meyer, Fry's, Smith's, Harris Teeter, and several others around the country. Look for them in the freezer case near you! They are great to take to work and nuke for lunch. They come in a microwavable tray of 2 of the same flavor. 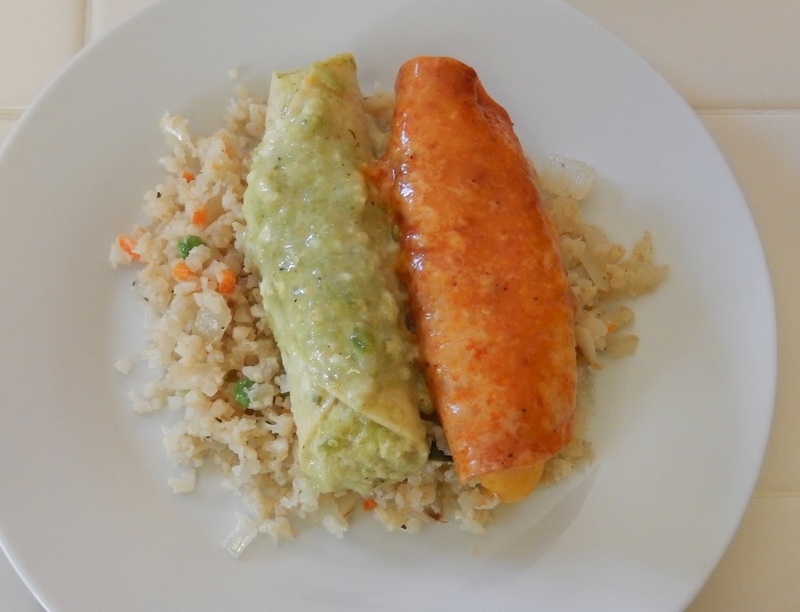 For dinner, I love to make 2 different flavors and give each person one of each. I served them that way tonight with another great frozen product Green Giant Riced Veggies (cauliflower, peas, carrots.) I added some sauteed onion, a couple of cloves of garlic, chopped and a 1/2 teaspoon of ground cumin to give the riced veggies a little Mexican vibe. The whole dinner was done in less than 15 minutes. Delicious, or should I say delicioso! This post is sponsored by Real Good Foods. For the purposes of this post Real Good Foods provided me with products reviewed. Thanks for the opportunity to share the good news about the enchiladas. All shared opinions are mine. These are soooo good. I would have never thought of adding extra spices to the cauliflower rice, can't wait to try it again. My hubby and I love these and split them like you described! We've found the pizzas at our closest Walmart once and keep looking each time we shop!!! For now we can get them at a nearby health food store. You're right, that is a cool product. It's so nice to see companies thinking outside of the box. Although, you don't seem to get much food for the price. Were they satisfying? They have them at Shaw's.